Osteoarthritis is a major cause of chronic pain and disability in our society today. People with arthritis typically report deep, aching pain in the joints affected as well as stiffness and inability to get up and get right out of bed in the morning. The most common treatments for this painful condition include cortisone injections aimed at decreasing inflammation, over-the-counter NSAIDs (non-steroidal anti-inflammatory drugs), and knee replacement surgery once the condition significantly worsens. What is going on in my joints that causes this pain? 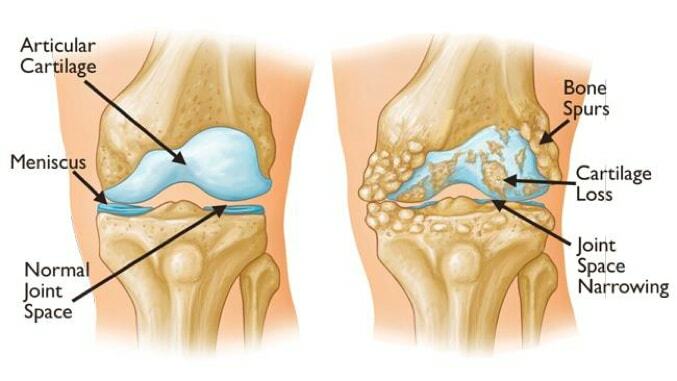 Osteoarthritis is a degenerative condition that leads to wearing away of the outer layers of cartilage and bone as you can see in the image above. This causes an inflammatory process to be induced by the body which leads to swelling, increased sensitivity to touch and pressure, and pain. On an X-ray, you will see decreased space between the bones and potentially bone spurs, which the body lays down in response to excess pressure in the area. This inflammatory condition typically leads to inactivity, which then leads to decreased range of motion along with muscle weakness. What will physical therapy accomplish? The hallmarks of arthritis include joint stiffness, swelling, muscular weakness, and pain. In physical therapy, your therapist will prescribe specific exercises that will help improve range of motion, and therefore, stiffness, as well as exercises for strengthening the surrounding muscle groups. These exercises will also act to help decrease the central nervous system’s hypersensitivity to pressure and touch, which will allow you to perform your daily tasks with much greater ease. Your therapist will also work on improving your patterns of movement in order to ensure that you are decreasing the pressure on your arthritic joints and using the most efficient pattern available to your body. There are also modalities and other methods used that will help to decrease the amount of swelling in the joint, which then leads to decreased pain. Great. Stronger muscles, improved range of motion. How exactly is this helping my condition? Good question. I would like to start by saying that there is currently no way to reverse the arthritic condition. That being said, I would like you to consider this example. Think about a stiff and swollen knee joint. When a person bends their knee, the stiffness in the muscles and fibers of the joint force the bones to glide along a smaller surface area. This will eventually lead to more breakdown of the cartilage and outer layers of bone, which means progression of the osteoarthritis. Now imagine we have a knee joint that has been sufficiently stretched and has less swelling. These bones glide in a smoother manner across a larger surface area (due to less range of motion restrictions). Now that the force can be spread evenly across the bony surfaces, there is a much less chance of increasing breakdown of the cartilage and bone. Strengthening the muscles helps to ensure that while walking or performing other functional daily tasks, the joint is kept in a position that ensures proper alignment and efficiency of muscle function. This formula along with a prescribed home exercise program will prevent progression of the condition and assist in avoiding knee replacement surgery. Check out this brief video which shows how to utilize a “hip-first pattern” to help offset pressure on the knee joint when bending down and squatting. Newer PostHow Do I Warmup Prior to Lifting Weights?